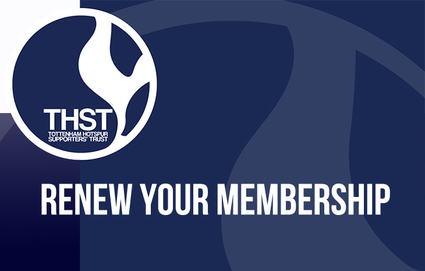 The main reason to join THST is to make sure that you have a way of getting your opinion across to the Club, in a way that they have committed to listening to. We also provide advice to fans who contact us on a wide variety of ticketing and safety issues. This includes providing assistance with ticketing enquiries, facilitating and mediating complaints against the club, representing fans who have been unfairly treated and, where necessary, providing access to legal counsel. As a volunteer-led organisation, our capacity is sometimes stretched in this major part of our work, but our objective is always to ensure the interests of fans come first. Click the above banner to Join THST. You will then be diverted to an external page to complete the registration process. Click on the banner above to renew your membership. If you are logging in for the first time please use the email address you have registered with and create a password, following which you may proceed to renew.